Aura Design Florist is situated within the grounds of Orsett Hall and is a specialist bespoke floral designer, creating exquisite designs for weddings, funerals, anniversaries, parties, baby showers, proms and corporate events. Aura Design Florist is our recommended florist for weddings and events here at Orsett Hall, but they also cover all areas and venues in and around Essex. They can also supply bouquets for any occasion and offer a delivery service. For weddings and events, Aura Design can supply anything from classic vintage themes incorporating birdcages and cake stands, using beautiful muted tones of fresh seasonal flowers and foliage, to stunning displays of candelabras and glass vases draping with crystals or pearls. They offer a free consultation to enable them to understand and interpret your ideas. Their aim is to make your day magical and memorable irrespective of budget! Other additions that Aura Design can offer you for your day can include a traditional candy cart, which is filled with an assortment of sweets. A gorgeous fairy light backdrop which can be used behind your top table or to enhance your dance floor. 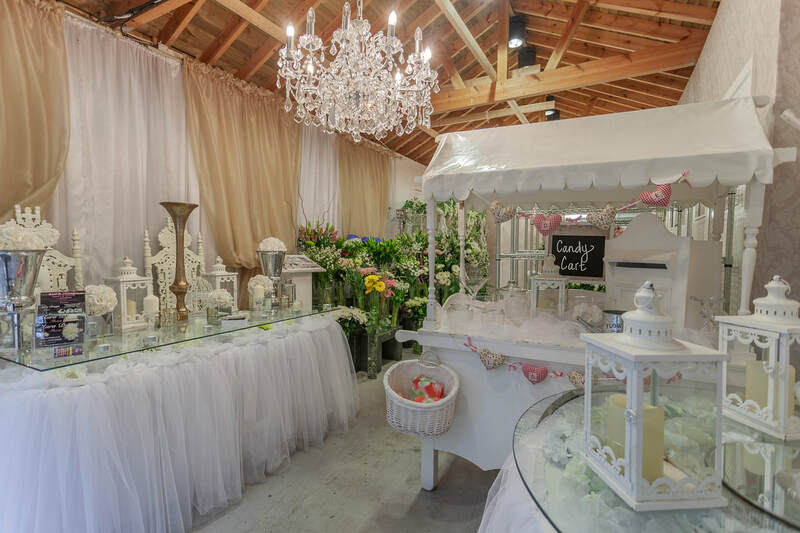 Their beautiful new glass topped cake and gift tables are a must. They also provide a balloon decorating service. The Sitting Rooms is situated within Orsett Hall and caters for all of your unisex hairdressing needs from everyday to special events such as Weddings, Proms and Special Events. Are you stuck on what to buy your loved one for their Birthday? Then why not treat them to a relaxing cut or colour for their hair. To order your voucher, call us on Tel: 01375 893081. A bride's hair has a lot to live up to on the big day! There is certainly a lot of choice out there when it comes to bridal hair and wading through the racks of bridal magazines is certainly not for the faint hearted. The Sitting Rooms can help you decide by offering professional advice on whether to go for a romantic classic chignon or a more contemporary modern look, the L'Oreal professionals with over 10 years' experience can help you choose a hairstyle to suit your dress and personality. In addition to a showroom at Orsett Hall, we have an off-site unit where we store the other cars. You can select a car from our wide range of vehicles ranging from Classics to Super Cars to American Muscle! JJs Limos has Rolls Royce Phantom available to book for your special day or special occasion.